Former director of the National Council of Teachers of Mathematics Dave Masunaga and MoMath have made special arrangements with Arthemisia, Italy’s leading art exhibition producer, to guide participants through the American debut of Escher: The Exhibition & Experience, an exhibition of over 200 works by the iconic Dutch artist M.C. Escher, which is currently on display in Industry City, Brooklyn. The exhibition is curated by Mark Veldhuysen (curator of the M.C. Escher Foundation Collection for over thirty years) and Federico Giudiceandrea (one of the world’s foremost collectors of, and experts on, the art of M.C. Escher). Masunaga’s connection with Escher stems from studies with his graduate mentor Dr. Arthur Loeb, the first person to bring M.C. Escher to the United States, and his friendship with George Escher, M.C. 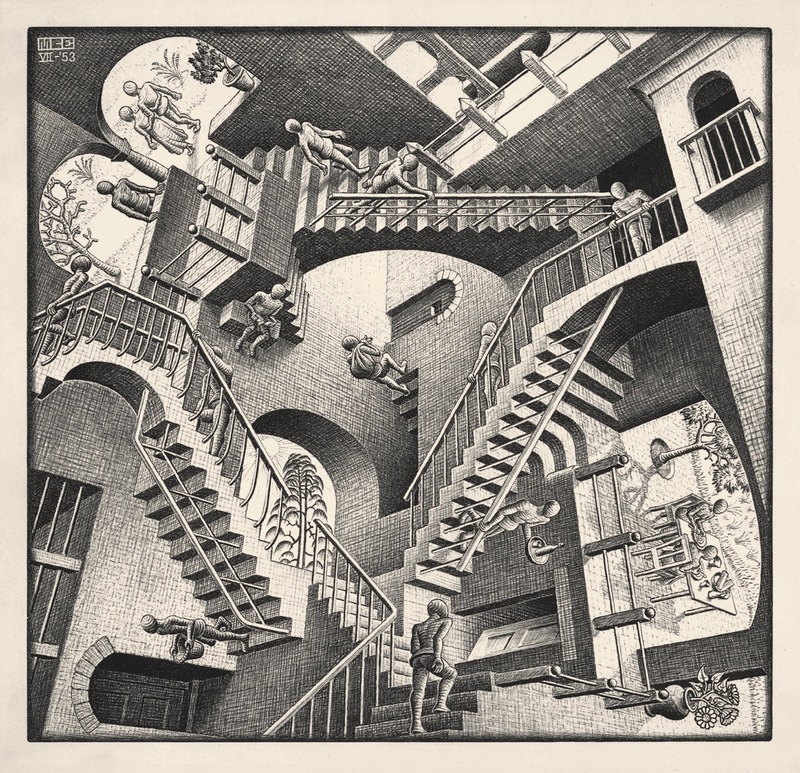 Escher’s eldest son. In addition, for many years Masunaga has worked closely with the curators of the Escher pieces at the National Gallery of Art. Tickets are $40 and include admission to the exhibition. Tickets are available online via the registration links below. If available, tickets at the door will incur an additional charge. Once purchased, tickets for any one of these tours are NOT exchangeable for tickets on any other of the tours and there are NO REFUNDS. Please note that you MUST purchase tickets directly from MoMath to join this tour; tickets purchased from the Escher exhibition site do NOT provide access to this tour and may not be refundable.